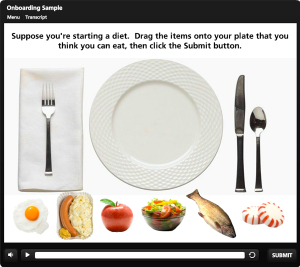 New eLearning Samples Page Is Now Available! I’m delighted to announce that I’ve added an eLearning Samples page to this site. On this new page, you will be able to launch and view any brief eLearning courseware samples that I make available from time to time. Currently, I have two samples available: an eLearning Process Overview, and just completed: a New Hire Onboarding introductory module. You can view these on your PC, or read the job aid I provide on that page to learn how you can also launch them on your iPad with the free Articulate Mobile Player app. I’ve even made them available for download to your iPad, so you can play with them even when you’re not connected to the internet, which is pretty cool. Enjoy, and let me know what you think!